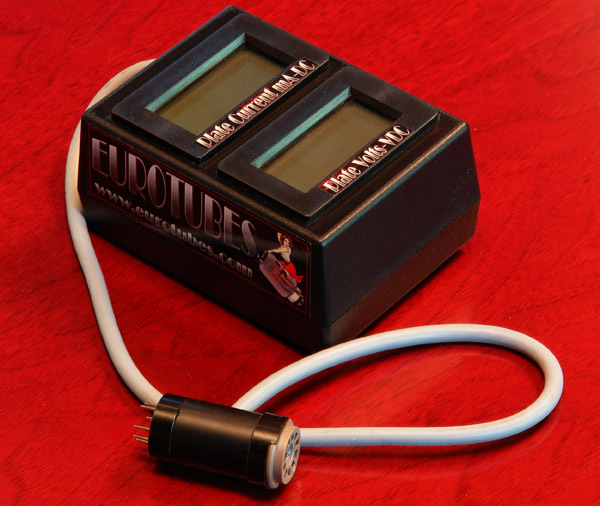 The ET "Pro One-9” Bias Probe is an "all in one” bias probe for Noval 9 pin tubes including EL84’s and EL844’s. It is unique in the fact that it shows you both the plate current and plate voltage simultaneously and it is completely self-contained with no switches, knobs or batteries. The "Pro One-9” Bias Probe will read out the plate current in the upper readout and the DC plate voltage in the lower readout. Unlike other bias probes the "Pro One-9” Bias Probe is designed to allow you to play the amp while the probe is installed. So adjust, play, adjust and dial your amp in! The Pro One was designed to be the ultimate reference bias tool. Each unit is hand assembled and calibrated in-house. It's powered using an extremely small amount of AC heater voltage. This eliminates the need for batteries or external power supplies of any kind. Cathode Bias Note: The Pro One uses the cathode connection as its ground reference for the plate voltage measurement. This means the cathode voltage is already subtracted from the plate voltage and figured into the reading (saving you a step). The video below explains the difference between bias probe types.